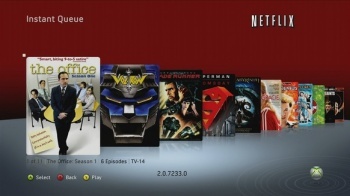 A new Netflix subscription plan seems like it was made for those that only use the service on game consoles. Netflix slowly crept its way into each of the big three videogame consoles of the current generation, first having success on the Xbox 360 and later giving the same experience to PlayStation 3 and Wii owners. The service has proved popular on the systems, and Netflix has recently come out with a new, slightly cheaper plan that ensures their users never have to deal with the pesky mail again. Today, Netflix unveiled a streaming-only subscription plan that has been in the works for a while. The new plan will cost $7.99 a month and includes no DVD rentals, but simply all the streaming television shows and movies you want. But isn't that just $1 cheaper than Netflix's previous lowest cost plan, you might ask? No, it's $2 cheaper, because Netflix also recently jacked up its prices by around $1 per DVD of its current plans. The single DVD plan now costs $9.99, the two DVD plan costs $14.99, the three DVD plan is $19.99, and so on. Netflix says the slight price hike is to accommodate the rising number of users streaming movies online, which has outpaced the people watching DVDs by mail. I know, the Xbox 360 and PlayStation 3 are DVD players themselves, but the new streaming-only plan seems like at least a partial nod to those using their gaming consoles for Netflix. It's much easier to search for a movie or television show on the consoles and watch it instantly, sort of like the instant gratification of a game, rather than waiting for it through the mail. Sure, the selection isn't as large as the DVD plans, but it's constantly growing. The new streaming-only plan is available now, so if you want to swap from your existing subscription go here.